FA: Bryan Law, George Ridgley, Linda Jarit, October 2007. Fun varied climbing with a sweet 195-foot 5.6 crack second pitch. After a short 3rd class approach, the first pitch climbs straight up past thin crack, overlaps, knobs, and edges. The anchor on Pitch 2 is 230 feet from the ground, so if you don’t want to walk off, either rap with two 60m ropes and downclimb the 3rd class to the ground, or rap over right and set a base anchor, climb Cheetos & Everclear, and then rap to the ground. 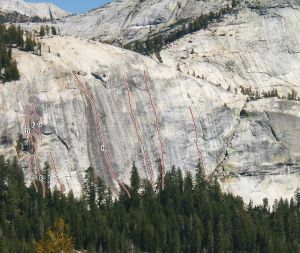 To the left of Isostacy is Granite Garden (5.9 X), a 500-foot free solo. Which SuperTopo guidebooks include a topo for Isostacy?